Yesterday's news that the next Ratchet & Clank involves tower defense elicited at least one groan from a reader who recalled what a wretched addition tower defense was to last year's Assassin's Creed. Tower defense games may be popular—who doesn't love setting up rows of towers to kill marching enemies?—but some series just don't need it. Maybe Ratchet & Clank doesn't need tower defense. But what I saw of Full Frontal Assault yesterday suggests it could work. The downloadable Full Frontal Assault is separated into levels (only five, which admittedly seems like a low number). Each level is a battlefield, with Ratchet's weapons spread throughout, hidden in pods. You'll have to run around, jump, zip around on hover boots and do other platforming actions to reach the weapons—the best ones are the most hidden. Enemies will show up and, as in previous Ratchet games, you can shoot them. The twist comes near the end of the level, when an alert goes off and a "major assault" begins. Enemies begin to flood in from all over the place. At this point, Ratchet is able to run around the level, setting up turrets. This is when the tower defense begins. He's constrained by the amount of bolts he has, which were obtained by killing enemies before the major assault. The game is full of the silly weapons franchise fans like. We've got laser guns and flamethrowers and turrets that shoot disco balls that make enemies dance. There's still a gun that turns enemies into sheep, though this time the sheep fight for you. 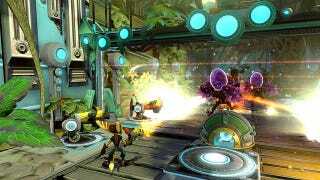 You can play as Ratchet, Clank or Captain Qwark, and the game supports two-player co-op, online or split-screen. I wasn't able to play Full Frontal Assault, but from what I could see, this is a sensible application of tower defense. This should work. We'll see in the fall when the game is released as a PS3 download on the PlayStation Network.